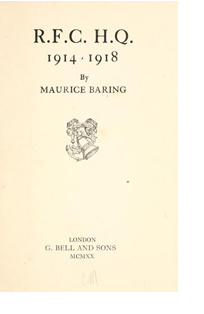 The information below all comes from Maurice Baring’s war memoirs, called R.F.C. H.Q. 1914-1918 (London: G. Bell, 1920). In May 1914, Baring was travelling with a Russian friend, and when they came to Warsaw they talked about the military and strategic problems which might be created for a future European war by the lack of standard railway track gauges. It was the first time Baring had thought of a possible war. The next time was when he was in Berlin, and bought a paper which announced the assassination of Archduke Ferdinand. At this time, there appeared a strong possibility of another war in the Balkans. One of his friends thought of organising a Red Cross mission to Serbia. He had thought of going to Russia at the beginning of August, but was advised against it. He went to hear Asquith’s statement in the House of Commons on 4 August. As soon as he heard war had been declared, he set about trying to see how he could get involved; since his French was very good, he hoped to be of use in France. He went to discuss it with his friend General Sir David Henderson, who was in charge of military training. On 9 August 1914 he was informed that he was a lieutenant in the Intelligence Corps, attached to the Headquarters of the Royal Flying Corps. He had serious problems getting his putties wound properly around his legs, but Sir David Henderson helped him. We arrived at Amiens at 12 o’clock and reported to the French authorities. Longcroft wanted to go up to the Aerodrome at once. This upset the French authorities, who said they had not yet had their déjeuner. Here for the first time we came into contact with one sacred, almost appalling fact that, whatever happens, the French nation must not be disturbed during the hour of their mid-day meal. Whatever happens they must have their déjeuner at the appointed hour, and the rite must not be disturbed or curtailed. It was said later that when General Foch was offered the supreme command of the Allies Armies, he only made two conditions; the first was that he should take over the command at once, and the second was that whatever happened he should never be disturbed during the hour of déjeuner (15). On 14 August he went to Mass in Amiens Cathedral, where Edward III heard Mass on the way to Crécy (17). He began to re-read his pocket edition of Dante, as had had done during the Manchurian War. He resolved to read a whole Canto each time, and not to read it at all if there was nothing more readable at hand. He put a date against each Canto as he read it. He finished the last Canto of the Paradiso the night the news of the German request for an Armistice reached Paris. He and his colleagues spent their time trying to organise aerodromes, and supplies, and began experimenting with planes as war-machines. On 18 September the first experiments with dropping bombs from the air were made: “one bomb was dropped, and it exploded but not exactly where nor how it was expected to explode” (45). Kitchener soon decided on a massive expansion of the RFC: he wanted fifty squadrons: “it is impossible to make people understand now how fantastic that seemed then” (47). There was a chateau quite close to Fère-en-Tardenois, where we went one day, one of the saddest and most beautiful places I have ever seen. In the garden there were great avenues of trees and a large Renaissance viaduct. Everything was buried in gold and crimson leaves; and Death seemed to be holding a quiet revel there, like a king who commands a private performance in a secluded retreat for a few friends, far away from the theatres of carnage where his public actors were performing daily with so much sound and fury. In the church at Fère-en-Tardenois, Mass used to be said to a congregation huddled in the chancel, while the aisle was full of wounded and a faint smell of iodoform pervaded the place, and a hospital orderly made the Curé laugh by saying the place would be much better ventilated if the stained glass windows could be broken. I remember the clicking of the typewriters in our little improvised office, and a soldier singing “Abide with me” at the top of his voice in the kitchen. And then the beauty of the Henry Farmans sailing through the clear evening, “the evening hush broken by homing wings,’ and the moonlight rising over the stubble of the Aerodrome, and a few camp-fires glowing in the mist and the noise of the men singing songs of home (50-51). On October 7, a German plane dropped a bomb on the aerodrome. “Theoretically, it was a beautiful shot, practically it hit a turnip. And this was the case with many bombing efforts in the future” (52). As the Germans approached, the decision was taken to move the HQ to Saint-Omer; later they moved to Hazebrouck. In August 1915 Henderson was replaced by General Trenchard, whom Baring had known since the beginning of the war, when he was Major Trenchard, operating out of Farnborough. Trenchard gave Baring the opportunity to go to London to discuss what he should do; clearly he did not relish working with Trenchard. But Henderson advised Baring to stay in France, with the new man, which is what happened. In January 1916, Baring was called to the War Office, and was told by Henderson that they wanted to send him to Russia, to organise propaganda. “The gist of his argument was that it stood to reason I must be more useful in Russia than I could be in the Flying Corps” (127). Baring objected to this assumption vigorously, arguing, among other things, that French interpreters were really important for the RFC. General Henderson finally said that he wasn’t going to order Baring to go to Russia; and Baring said that he would only go if ordered. Baring returned to France, to continue to work with Trenchard. In 1916 Baring put a lot of effort into preparing the RFC backup for the Somme offensive; a captured memo from General von Below in January 1917 showed how very effective the RFC had been in “inspiring our troops with a feeling of defencelessness against the enemy’s mastery of the air” (201). In June 1917, there was a dinner for Old Etonians. Baring described it in a letter: clearly the antics of the Bullingdon Club in the days of David Cameron and Boris Johnson had a long history. Last night there was an Old Etonian dinner at the Lord Roberts Memorial Hall. There were about three hundred Old Etonians present; I know about five by sight. All my contemporaries were Lieutenant-Generals. They sang, accompanied by the Coldstream Band, and after dinner everything in the room was broken: all the plates, all the glass, all the tables, the chandeliers, the windows, the doors, the people. A bomb raid was nothing to it. Lord Cavan presided, and made a very good speech in Latin. It was answered by someone else, a scholar, in bad Latin. The guests spoke English. There was not one representative of the Julian and Billy Grenfell generation. They have all been killed. The rest were either much older than me. Or much younger than the war (227-8). 1917 turned out to be a turning point in the air battle. Our problems and our difficulties […] had changed. We were no longer behindhand in equipment. But flying had not only become higher but lower, and another important problem had arisen. The French towns and the places behind our lines were being heavily bombed too. The problem which we had to face and solve now was how to defend England and how to attack Germany without interfering with the work of the Armies, without diverting from the Armies of the Western Front such aircraft as was essential and indispensable in order to enable them to fight (251-2). Later, Baring summarised what it felt like in a letter describing the day before Christmas Eve, 1917. Tomorrow it is Christmas Eve, and one naturally wonders how many more Christmas Eves we shall have to endure darkened by the shadow of war and overhung by the threats of air-raids. Let us hope not many more. As for me, I am finished. My spirit is broken, my moral is deplorable, my feet is covered with chilblains, the fingers are stained with the nicotine of Virginian cigarettes, my hairs, which are grey and few in number, want cutting, my shoes, worn in the evening, have got holes in the soles of them, my books pinch me and are cold as vaults. Apart from all this, I am in very good spirits and I think the war prospects are much better than they were last Sunday. Why? I cannot tell (263). On the 29th Baring and others went by train to Boulogne, starting at 5 a.m. and arriving at 1 pm. It was decided that the RFC and the RNAS were joining together into the RAF. Over the next few months Baring said little in his memoirs. As the German offensive faltered, and their retreat started, Baring started preparing for the end. His book ends with the following, dated 11 November 1918. The Independent Force was at once demobilised. On the 14th of November its Squadrons came under the command of the Field-Marshal commanding in Chief the British Army in France (303).